This week South Africa is in turmoil as native-born Africans have turned against expatriate Africans, claiming their presence in the country robs them of jobs and housing. As violence has broken out in communities all over South Africa, people have fled their homes to congregate in hastily constructed camps. 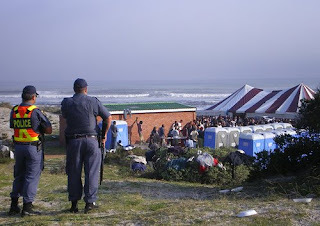 Not far from where our communication team has its offices has sprung up the largest refugee camp in the Western Cape. We have been visiting daily, volunteering to help with food distribution and tent construction, but also hearing people's stories and taking photos. On Monday we joined with staff and students from the YWAM center in Muizenberg for their time of intercession, informing them about the refugee camp and mobilising people to help out. Meanwhile our email inbox is filling up with stories from other parts of the country, from YWAM teams that are not simply going to places to help the refugees, but who are living and working amongst them. Their stories need telling as well, because in the face of division there are stories of unity across races, in the face of desperation there are stories of hope and in the face of hardship compassion is being demonstrated by the people of God.